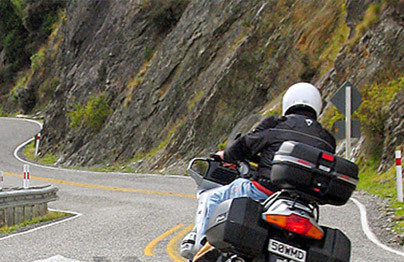 Are you the “I know where I’m going, get out of my way” sort of rider? Then simply hiring one of our late model motorcycles could be for you. 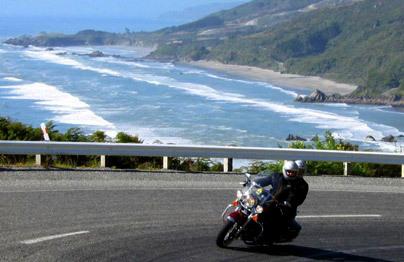 However, if you have limited time in New Zealand and you just don’t want to risk missing the best roads, the best places to stay, the best things to see and do, the best wine and cuisine…. and perhaps more importantly, avoiding the worst places, the bad cafes food and boring roads… then check out our Self Guided Tour or Guided Tour options – we built these to remove the fish-hooks that can spoil your holiday here. Our fleet of motorcycles is made up of the latest and greatest, and great value-for-money models from manufacturers such as Triumph, BMW, Harley Davidson, Honda, Suzuki, Yamaha, and Kawasaki, to name a few. We strive to offer an exciting and interesting range to suit all tastes and preferences. Not only can you tour the best place in the world – you can tour on a model you’ve always wanted to try. 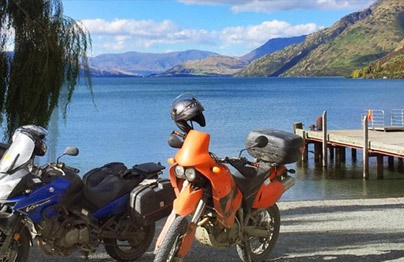 When choosing your motorcycle, look out for this “GoTourNZ Recommended” symbol, we have selected a few machines that in our opinion are a cut above and usually represent great value for money and again, in our opinion, offer a better alternative to some other machines that you may choose. All of our rental motorbikes are excellent mechanical and cosmetic condition, and we charge a fair and competitive price for them. To cater for a range of budgets and preferences, our fleet consists of a mix of the latest and greatest current year models, and also some great value-for-money 5-6 year old perennials, like Hondas ST1300A (relatively unchanged since it’s 2002 debut) and BMW’s R1200RT and GS models. Across the entire range, there are no torn seats, warts, duct tape, spray-on chrome or battle scars. If you have a make or model you wish you could tour on but don’t see available, Contact us and we’ll consider adding it to our Tour & Rental fleet. All rental motorcycles are the same ? A Rental is a Rental is a Rental, right? Except when you have a problem, like a puncture, a breakdown, a (fingers crossed) accident. That’s when you find out there’s more to renting a motorbike than just the motorbike – that’s when you find out the quality of the company you dealing with. When you hire your bike from us, you’re hiring more than just a bike – you’re also getting our care and attention, and our guarantee that if you have a bike related problem (no matter who’s at fault) we’ll help rectify the problem within 24 hours, no matter where you are in New Zealand..
One thing that irritates us when we rent a vehicle is finding hidden additional charges that that we hadn’t counted on – a bit extra here, a bit extra there. In the U.S. this is called “Nickel & Diming“. So we’ve been upfront and INCLUDED hard luggage/panniers in our rates on the assumption they’re a necessity.